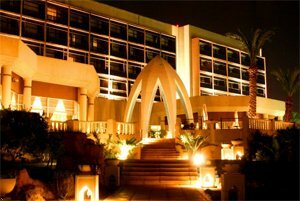 Located in the business and diplomatic district, the Sheraton Tunis Hotel& Towers overlooks the entire city of Tunis. All 285 guest rooms feature balconies with either garden or city views. Our Towers rooms include evening cocktail service and hors d'oeuvres in our private Towers lounge. Discover an excellent selection of business and leisure facilities with efficient service and modern amenities. Local attractions include the charming Arab Medina, the Ruins of Carthage, and the Bardo Museum. Take Boulevard November 7th for approximately 5 kilometers. Turn left at the first traffic light, and continue for approximately 300 meters. The hotel is located on the left. Follow the highway towards the Tunis-Carthage Airport. At the intersection, take Boulevard November 7th and continue straight for approximately 5 kilometers. Turn left at the top of the hill. The hotel is located on the left. Follow the highway towards Tunis. Turn rightat the Carthage Airport intersection. Proceed straight on Boulevard November 7th for approximately 5 kilometers. Turn left at the first traffic light, and continue for approximately 300 meters. The hotel is located on the left.